I’m not sure how I feel about people calling me “hun”. I know it isn’t intended to be demeaning, but something in me balks at it. It doesn’t bother me much when the middle-aged woman at the grocery store calls me “hun”, I’m still caught off guard a little by the implied familiarity, but I guess I just chalk it up to maternal instincts. However, when men call me “hun”– it bothers me. This has happened a few times in the last year or so, including a student of mine in a class I was TAing last fall and the dude at Subway just now. The student calling me “hun” was entirely inappropriate, and if it had happened again I would have had to address it (at the time I was too surprised) but he was a good deal older than me, so that perhaps explains his lack of boundaries. But this dude at Subway just now? I’m pretty sure I’m older than he was, so that explanation is out. Who the heck is he to call me “hun”? And it’s not like I misheard, he said it a handful of times throughout our 2-minute checkout exchange. It’s very strange. I know there are plenty of worse things to be called than “hun”, but apparently the feminist inside me hates it! Perhaps because it seems a mere stone’s-throw away from “toots” or “sweetcheeks” or some other patronizing, pre-sexual-harassment-era term of endearment. Maybe they think it’s sweet, but it bugs me. Is a man calling a woman he doesn’t know or barely knows “hun” inappropriate? Is it sexist? Is my being bothered by it coming from men but not women sexist? These are the burning questions that occupy my thoughts when I am procrastinating beginning yet another pointless bout of data analysis. This is a bit of a Taygete shawl by Rosemary (Romi) Hill that I began back in August. 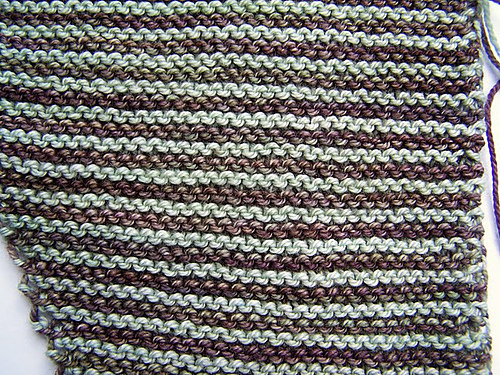 The shawl is knit end to end alternating stripes and then you pick up along the bottom edge to knit a lace section and surround the whole thing with a picot edging. It should be lovely when it’s done, but I’ve become disenchanted with it. I’m just past the midpoint of the lengthwise section and although I believe it will be a very pretty shawl when it’s finished, it’s really kind of boring now. I loved the color combo when I chose it, but now I’m feeling like it’s more of a fall combo than a winter/spring combo and I don’t think I have many outfits that will match it after all…it’s just not revving my engine. I wish it was. I’ll still work on it b/c of its mindlessness, but this is how I end up with projects that are on the needles for months and months and months. Disenchantment… the silent FO killer. This entry was posted in Bugga by shoelaceswitcher. Bookmark the permalink.